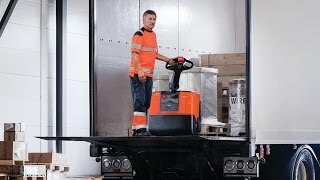 The BT Levio LWE130 powered pallet truck is lightweight and compact. Weighing just 255kg including it's battery and built on a compact chassis, this powered pallet truck is ideal for use in confined areas such as retail stores and on delivery vehicles. it's high power AC motor helps it transport loads of up to 1.3 tonnes efficiently and easily whilst maintaining low noise levels, making it suitable for use in noise sensitive environments and out of hours deliveries. For increased flexibility when the machine is used on a lorry. Incl cable.